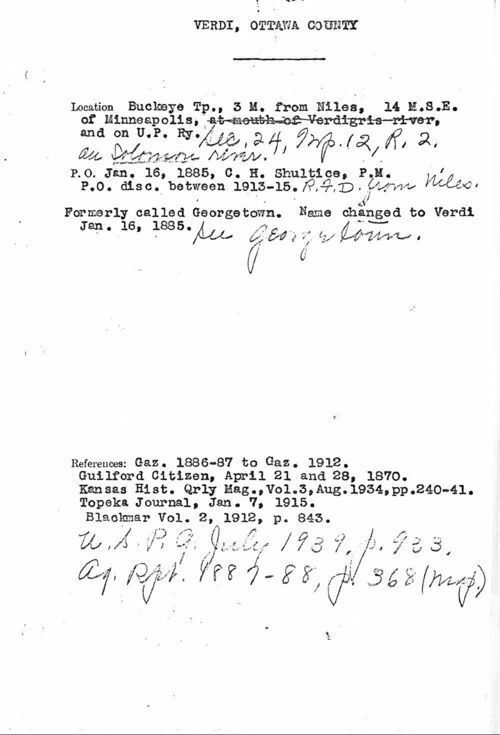 These three references document the history of Verdi, Kansas, and its predecessors Georgetown and Coal Creek. The references appear in "Little Known or Extinct Towns of Kansas," a Kansas Historical Society compilation including information on more than 5000 Kansas places, ranging from long-vanished ghost towns to still-thriving but little-known smaller communities in the state. Mary Emma Milner Montgomery and others complied the references between 1904 and 1940.